Inter runs riot while Osvaldo conquers Tuscany! INCREDIBILE!! Milan dominate but fall once again! Palermo vs Milan... the show must go on. Maldini slams faithful tifosi! Or are they really? The return of Rui to the San Siro! Carlo thinks of Benfica as star trio are left out. Don's men do the job, as Italy go second. Can Don do an Italian job on the Ukrainians? Surprise Surprise the Ronaldo saga continues. Lets give Andrea Barzagli some credit, no? 90 minutes gone, the Azzurri don't win again! Milan vs Kiev! 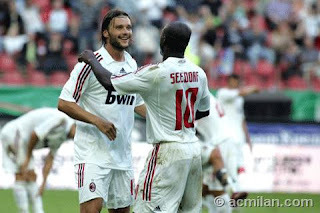 Pato's debut, Sheva against his old club! The French must get over it.